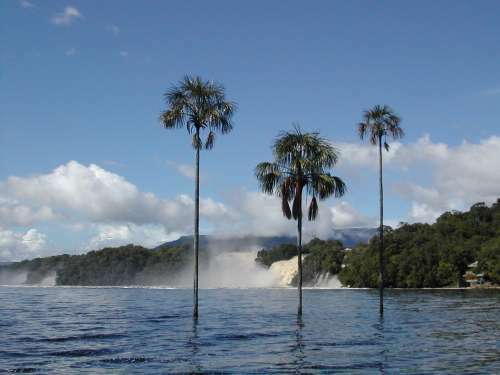 Encuentra tu Alojamiento en Canaima. Haz Clic Aquí!! 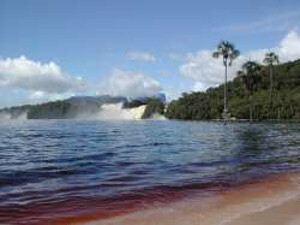 One of the most beautiful places in Venezuela is Canaima lagoon and its surroundings. 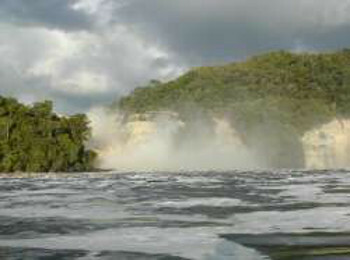 The lagoon is fed by several small water falls: Hacha, Wadaima, Golondrina and Ucaima. 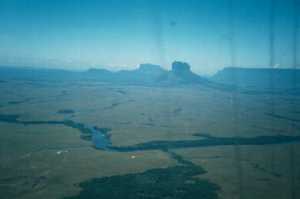 On the back you can see 3 "tepuy", those flat top mountains, that distinguish this region, they are called Nonoy-Tepuy ("Zamuro" or Vulture), Kuravaina-Tepuy ("Venado" or Deer) and Topochi-Tepuy ("Cerbatana" or Blowpipe). 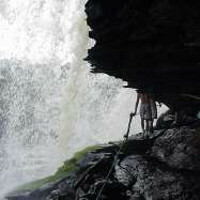 You can enjoy the navigation in a "Curiara" - those long canoes used by Indians - and a closer view to the water falls. Something really surprising is the color of the water and the sand. 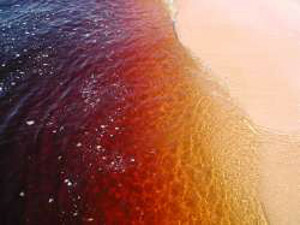 Due to the abundance of minerals, the water takes a red color and the sand has a beautiful light pink, because of the presence of quartz. 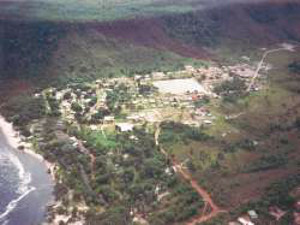 In the aerial view shown below, you can appreciate how the Carrao river, after bording the Auyantepuy, and being fed by water coming from the Angel Falls, splits in several streams, and forming islands. The biggest island is called Anatoly. 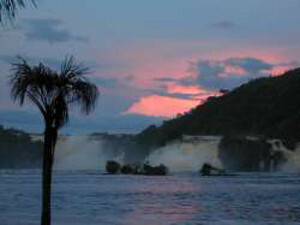 To the left, if you pay close attention, you can see the Sapo and Sapito Falls. 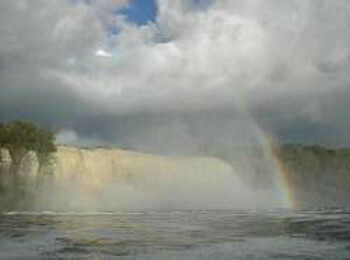 To the right the same water falls that we have shown before, feeding the Canaima Lagoon. Below the Ara fall, where the lagoon ends. You can (and should) take a "curiara" and have a closer look to Canaima waterfalls and reach the island Anatoly, from where you can see the Sapo (frog) and Sapito (little frog) falls. You will never forget the experience of walking underneath "El Sapo", on your way to "El Sapito". 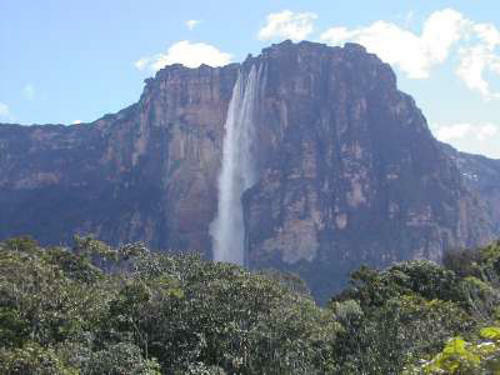 And of course, you can't miss the higher water fall and one of the natural wonders of the world: the Angel Falls. You can get there by air or navigating upstream the Carrao and then the Churun rivers. It is a long ride (3 hours and a half) and an hour walk that will take you to the base of the falls, where this picture was taken. But be reassured, you will enjoy the trip from beginning to end. Barlovento - Barlovento is a region in Miranda State, east from Caracas. Since the Guarenas – Caucagua highway was finished, the access to the region from Caracas has turned easier, making it a very interesting touristic destination on vacations. Parques Nacionales - Los parques nacionales de Venezuela tienen una especial importancia por preservar la vida salvaje, la naturaleza y por servir de excelentes lugares de recreación. De hecho, los destinos turísticos más reputados de Venezuela en el exterior, como lo son Los Roques y Canaima son parques nacionales.